When altar servers ask me how long Mass will be, my stock answer is that we will carry on until we have said or sung all the prescribed prayers. I do usually relent and then tell them roughly how long it will be, but I think it is good to teach that we are not governed by the clock. In the matter of influencing how long Mass will take, there is a significant difference between the celebration of the modern rite and the usus antiquior. 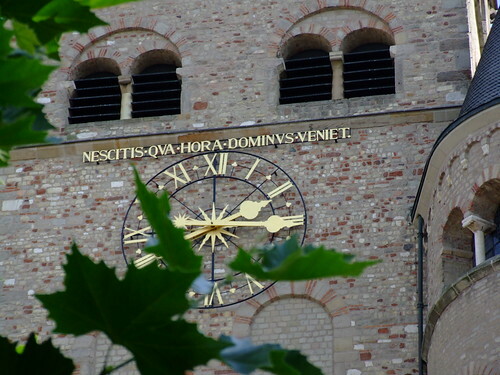 On the Pray Tell blog there was recently a discussion of the question of "Trimming Time", asking specifically whether it is better to use a shorter Eucharistic Prayer or to omit the sign of peace. Some of the suggestions, such as omitting the Gloria or Creed, or saying rather than singing some of the proper texts would not be considered in the older form of the Mass. In the modern rite, the selection of options can affect the duration of Mass in a way that is not possible in the traditional Mass. Aside from any such question, it is true that the length of the sermon significantly affects the overall length of the Mass, and the discussion of how long a sermon should be is always likely to go hand-in-hand with a discussion of the quality of preaching. This is most instructive. 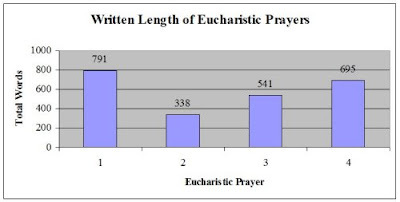 How many times have you been to a major liturgical function, lasting over an hour and a half, with lengthy introductions, announcements and the Litany of Thank-Yous, in which the priest or bishop celebrant chooses to use Eucharistic Prayer 2 or 3 so that Mass does not take too long? At a standard speaking rate of 150 words per minute, saying the Roman Canon would only take three minutes longer than Eucharistic Prayer 2. Of course, there are many good reasons for using the Roman Canon, and they have nothing to do with how many words are in it. My only point here is that its length compared to the other Eucharistic Prayers is a bad reason for not using it. Sunday book notices: "Laurus" and "Spoilt Rotten"
CD 287: Blessing after civil marriage?